I am the kind of person who likes to plan things out in my life. I like to plan out what meals I'll make for my family ahead of time, and if something has to change at the last minute, sometimes I freak out a little. Having a plan gives me a little control over my life, which now that I have a year-old daughter, is even more important to me. I've enjoyed games like Rune Factory 4 and Bravely Default which let me plan my actions out pretty far in advance. I hate it when games unexpectedly take you away from an area you could have done more sidequests in, or if I feel like I can't get off the narrative tracks. 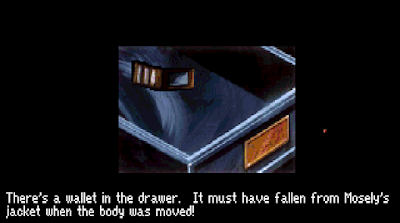 Another time I felt like I "missed out" was in Gabriel Knight: Sins of the Fathers. 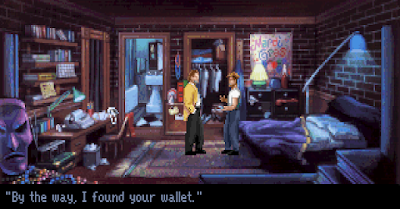 I found out that I could have returned a wallet I picked up for extra points, among other things. I felt both impressed that they included this detail and annoyed that it didn't follow other adventure game conventions where people don't care about their crap. I could have avoided this "missing out" if I had read through walkthroughs carefully. But as much as I like to plan things, I also enjoy not knowing what will come next. If never missing out on parts of games means never being surprised, I'm okay with missing out on a few things. And perhaps it's more realistic to have some actions have big, unpredictable consequences (like what race you choose in DA:O). It's hard to simulate "fate" in a computer game, since the entire storyline is obviously "fated" by the writers. But when a decision you make turns out to affect more than just the immediate situation, it can give the world a richer feel. That is, as long as it's not a dumb decision like whether you choose vanilla or chocolate ice cream (an actual decision in the branching-path graphic novel Meanwhile that determines whether or not there's any story at all).